It’s nearly showtime! The outer bracts have fallen away, and the spathe is now showing a slight purple cast. 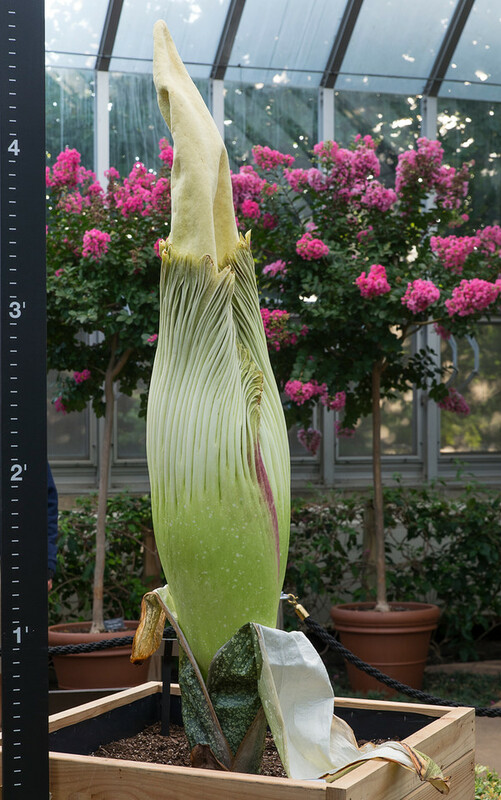 The care and feeding that we have given Spike and his fellow titan arums—our collection of nine Amorphophallus titanum growing in our production greenhouses—is very specific! Yes, the cultivation requirements for these plants are strict. Titan arums require well-maintained conditions of high humidity and high temperature—similar to their natural conditions in the tropical rainforests of Sumatra. Therefore, the cultivation is not particularly suitable for most beginners or homeowners with minimal greenhouse facilities. During Spike’s flowering stage, we make sure the soil is evenly moist at all times. This is important to continue flower development and prevent the spathe (the frilly modified leaf) from drying out or not opening. We also pay special attention to air humidity—we try to keep the humidity between 75 to 90 percent saturation at all times. How? We keep the floors wet and prevent excessive venting in the greenhouse. 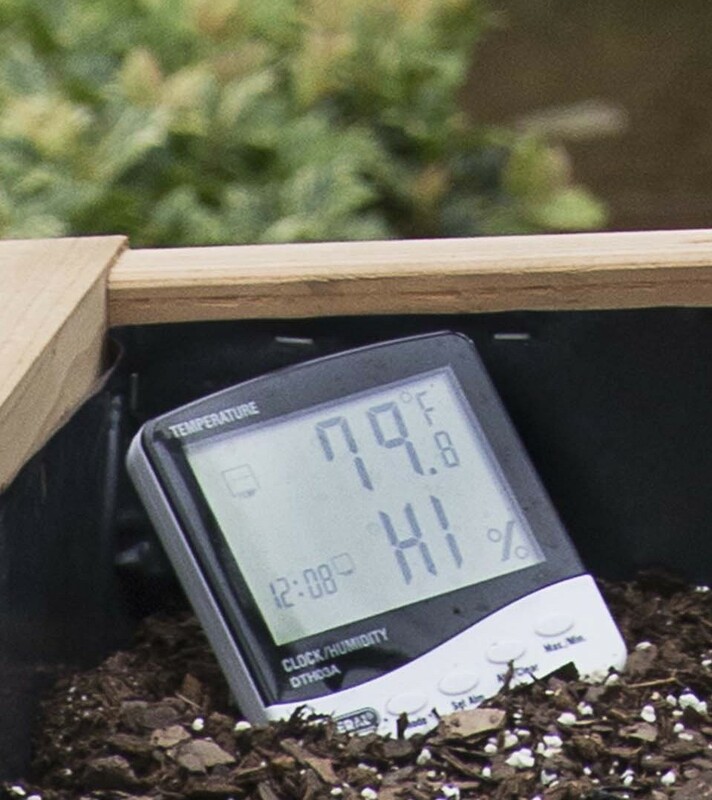 A hygrometer in Spike’s planter measures relative humidity in the greenhouse. 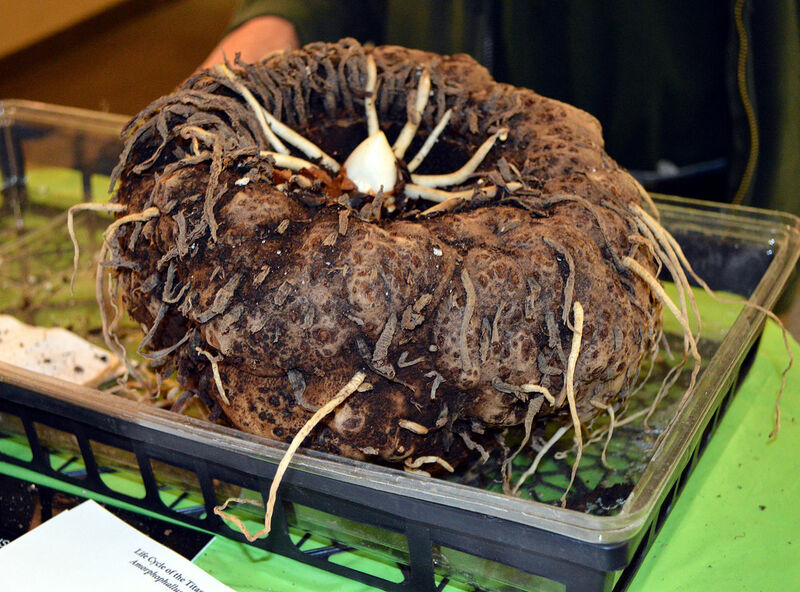 Spike and the rest of the collection have grown through many leaf and dormancy cycles into larger corms (a type of underground tuber or bulb). It would seem that tending the growing corms would be about as complicated as a typical bulb, but a close eye must be kept on how the corms are watered to prevent them from drying out or rotting. As the leaves grow larger each growth period (12 to 18 months), their increasingly larger corms may prevent the soil beneath them from becoming wet. Increasing watering to make sure the soil is kept moist at the bottom of the tuber could cause the corm to rot, as most of its roots develop on the upper surface. The growing medium must be evenly moist at all times, but not wet, and the soil should never dry out completely, especially at the start of leaf development. Using a loose medium and a layer of gravel drainage in the planters ensures that water reaches all parts of the corm without flooding it. Finally, we repot the corms—a lot—to make sure the soil stays evenly moist, and to give them room to grow! When repotting very large corms, it is important not to lay them directly on a hard surface. Their own weight can cause damage to the bottom of the corm and cause rotting. Photo by Georgialh (Own work) [CC BY-SA 4.0], via Wikimedia Commons. Spike was repotted many times as the corm continued to grow larger each season. In fact, several times the pots or containers that the plant was growing in would crack or break as the swelling corm beneath the soil surface would “push” outward and damage its container. Last fall, we finally had our carpenters here at the Chicago Botanic Garden make big 42″-by- 42″ wooden crates as a more permanent home to grow Spike and several others in our collection. At the end of each dormancy cycle, we carefully lift the corms, inspect them for pests or rot, and remove any unwanted new bulbils that may have formed. When moving these corms to their new homes, we provided extra drainage at the bottom of the crates by amending the soil with more perlite at the bottom and a layer of gravel. How hot is it in here, exactly? 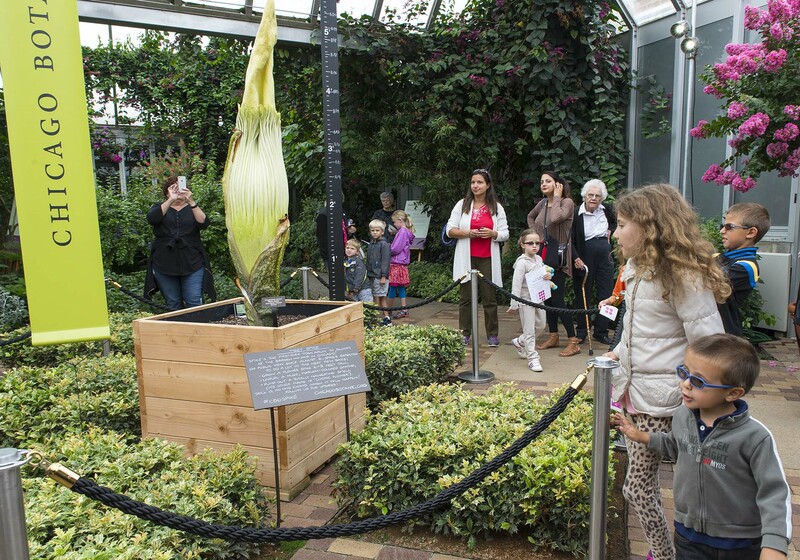 Not surprisingly for a Sumatran plant, Amorphophallus titanum prefer to be grown at temperatures between 70 to 85 degrees Fahrenheit during the day and 68 to 80 degrees at night—pretty warm, and without a lot of temperature fluctuation. Temperatures above 90 degrees or extreme cool temperatures may damage the foliage or flower, so we are keeping a close eye on Spike as visitors come to check on his progress. Spike also needs a lot of sunlight—both in leaf and flower form. We provide minimal shading to our collection (enough to prevent foliar damage), and only during the hottest summer months. Does that mean we need additional lighting to compensate for Chicago being so far north of the equator? Actually, no. No additional lighting or day length control have been necessary. The lights currently surrounding Spike in the greenhouse are for our time-lapse cameras, to make sure our star is lit evenly on his performance night! Does Spike need a lot of fertilizer? Definitely! Titan arums require high levels of fertilizer to be applied on a regular basis while in the leaf stage. We fertilized at every other watering, especially during the summer months, and reduced fertilization during the colder winter months. When we determined the emerging shoot of Spike was indeed a flower, however, fertilization ceased. Are you sure you don’t know exactly when Spike will open? We’re sure we don’t know for certain. We have key factors we look for, like the bracts (outer leaves) shriveling up and falling away 48 hours before a bloom. But this is not always the rule—in some cases, blooming is what makes the bracts finally fall away from the flower! In the end, only Spike knows when he’ll bloom. Spike’s fans check in in his progress—it won’t be long, now! As you can see, the cultivation of our Amorphophallus titanum collection can be somewhat challenging! Providing them with the unique cultural requirements to get them to live long enough and to eventually bloom is a mighty task. However, all the extra “TLC” given by our greenhouse staff will be well worth the long wait to see Spike bloom in just a few days.